New and expanding workloads are increasingly demanding more from enterprise mainframe systems. These workloads include applications running in the cloud, analytics, mobile device access to business applications, social media, and improvements in security. All these workloads are bombarding the IT systems with requests for information and providing new data to existing business applications. This ever increasing input/output (I/O) activity is stressing the ability of current IT systems to respond. The IBM® z13™ with many other I/O related improvements is ready to face these challenges. 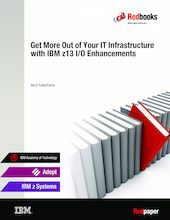 This IBM Redpaper™ publication discusses the z13 enhancements that enable dramatic improvements for new and expanding workloads, such as cloud, analytics, mobile, social media, and security.